Our lives are full of cardboard – it comes as packaging for nearly everything we buy. From food to consumer goods cardboard is clearly here to stay. But the good news is that it is a recycleable material, and it is not one of the worst culprits in our collection of man-made materials that clog up our lives, and ultimately, the ground, after we bury our rubbish. The UK alone produces over 8 million tons of cardboard for packaging every year, which amounts to about 140 large cardboard boxes for everyone in the country, per year. Cardboard is usually the largest single constituent of municipal solid waste worldwide. Cardboard is made from cellulose fibres that are created from wood pulp. To reverse this process, for the purpose of recycling, the cardboard is soaked and agitated, to release the fibres which can then be pulped. This process can be repeated up to 5 times before these fibres eventually shorten, and then disintegrate. How can we Recycle Cardboard? The first objective, as with all goods, be they packing materials or containers, coming in to our homes and workplaces, is to reduce the amount. Try to buy less produce or products that come wrapped or encased in cardboard. It might be worth checking out suppliers who use less cardboard, or telling them that you wish to receive products with less unnecessary packaging and encouraging them to reduce the waste. Consumer power has a lot of weight with producers and suppliers: once we realize this and use our spending power to pressure suppliers, a lot can be achieved, particularly in the area of waste prevention. One part of this could be always looking for cardboard that clearly displays the 'recycled cardboard' logo. This is a series of arrows at right-angles, often with a percentage in the middle – this percentage says how much of the component is recycled, often to a 50/50 ratio of new cardboard to recycled fibres. 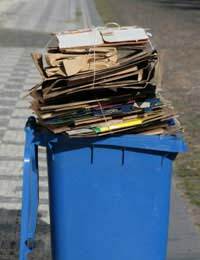 Many municipal authorities now give out a series of recycling containers to householders, and make separate collections for sorted recycleable waste. For example in Cambridge, a black box is for the fortnightly paper collection, and a blue box is for cardboard – in this case, cardboard of the egg box, cereal box variety, along with plastics and other materials. Many businesses now employ specialist recycling and waste removal companies to collect their business waste. Cardboard will be a big part of this, although some of these companies report that cardboard recycling is not yet economically viable, so much of it will unfortunately end up being buried. Cardboard without plastic coating, and without too much writing and inks within it, is ultimately biodegradable, and compostable. It is a good way to take responsibility at home for the amount of cardboard coming in, is to regularly add it to your composting system, as one of the layers of material, used to sandwich compost together. It adds air to the whole of the pile. See our page about home composting on this site. Cardboard will need to be either soaked in water, or shredded before added to the compost. Also, cardboard, in its shredded form, can be used for animal bedding, home insulation, either in the attic or between the walls. It is also being used in the green marketplace for biodegradable coffins. Finally, cardboard is a good component to use in the developing area of waste to energy: creating fuels and power from waste products. It releases twice as much heat per pound of waste, compared to other sources, doesn't release toxic poisons, and its only by-product is ash. Hi, we gathering cardboard (700 tons per month) in Mexico for its recycling. We do not recycle, we just collect and we make bales. My question is, do you knowwhat can we do with the cardboard besides the cellulose recycling? It's important for to know new ideas for the cardboard uses and I want to know the trends in UK about it. thanks!